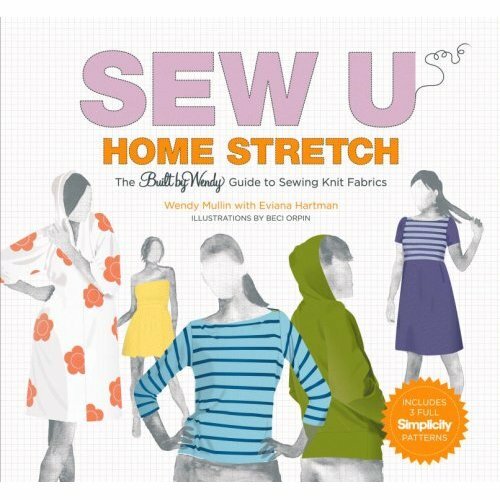 Little, Brown sent me a copy of Sew U: Home Stretch to review (and two more to give away!) and I've just had a chance to sit down and take a look. Although I think this book is not especially geared to my personal aesthetic (I lived through the 1980s the first time, thanks) the tips for sewing knits seem incredibly helpful. There's a real guerrilla, make-do tone; although a serger is suggested, you can make most of the knit projects in this book with your regular sewing machine. AND the book includes patterns! I'm seriously tempted to start making my own t-shirts (or at least shorten the ones I buy online) now that I've read this book. Then they would finally all be the right length! On to the giveaways: I'll give away the two copies to two people selected at random from those who've made recent changes at the Vintage Pattern Wiki by Friday night, CDT, June 20. (You don't have to join/log in to add to the wiki in general, but if you want to win a book you have to so that I can find you!) Not sure how to participate? here are the original instructions. Also, Jenny added a Fauxlero category! Go forth and upload and tag, please. If you're not into knits you might be interested in the first Sew U book, which I reviewed here. 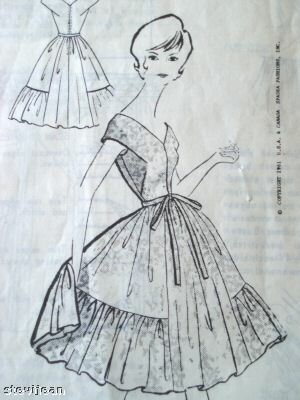 Naomi sent me this link, from Ramona West Vintage. I love that applique — so pretty and fresh. The dress is $65, and measures B37/H43. After I hit "Buy it Now" I realized that I didn't remember the last pair of shoes I'd purchased in a real store, which is pretty weird. (And I count discount chains like DSW and Loehmann's when I say "real stores".) I don't have particularly hard-to-fit feet (8.5, you are my friend) and I'm willing to pass along failures pretty speedily (or turn around and relist them if they don't fit). Has anyone else decided they can do all their shoe-shopping on Zappos and eBay? 1. The first rule of packing is to know your own strength. If you are planning to carry on a bag and cannot lift it above your head, you should not be carrying on that particular bag. (Obviously, if you are disabled and know you will have help in any case, this doesn't apply to you.) But packing more than you can lift is a recipe for disaster and will cause irritation to all your fellow travelers. In a similar vein, if you cannot drag your suitcase without it toppling over, you might want to rethink that eighth pair of shoes. Not only will your transit to the check-in line be wobbly and fairly ridiculous, the airline WILL charge you for the overweight. 2. The second rule of packing is to know your own style. This, of course, is something you should know for your whole life, not just for traveling, but you should especially know it for traveling. I hate and despise those traveling clothes that strip every last ounce of your personality from you in the service of being "easy to pack". (That dress in the link doesn't even have pockets! How is that travel-friendly?) When you travel, you should look like a concentrated version of yourself, in that your clothes are the ones in which you feel most like you. You'll be out of your natural element, so you can't rely on environmental clues to give folks an idea of what you're like. For me, this means I usually pack a lot of dresses (duh), bright cardigans to wear over them, and, for the airport, A-line skirts with pockets. Wearing the same thing every day (and/or washing things in hotel bathrooms) is not worth it. If you wash something, it never dries (and who wants to spend their time doing laundry on a trip? ), and if you plan to wear something every day someone spills something sticky or stinky on you. Better to just pack an extra dress. 4. Check the weather. Seriously. You'd be surprised how many people just assume the weather where they are going is just like the weather where they are. (You can't assume, for instance, that San Francisco in June is going to be warm.) There's this thing called the Internet, and a large part of it is just weather forecasts. I also understand there is an entire cable television channel devoted to the weather. Don't just check the forecast — check the average highs and average lows, too. And, on top of that, bring a sweater. Just in case. 5. Make a list. In fact, make several lists. I like to print out a calendar page (you can do this from Google Calendar pretty easily) and write down, for each day, what I'm planning to do, which then guides what I'm going to wear. A day spent in meetings will have a different wardrobe than a day spent traveling, sightseeing, or working in a hotel room. Pack the list! If you're traveling for more than a few days it's easy to forget what you were planning to wear when. Make the list very detailed, right down to your underwear. If the dress needs a slip, write "slip" on the list. Make another list of things that you need that aren't clothes. I like to bring my vitamins (in an old-lady case ), Emergen-C , a stretchy exercise band (to help me counteract bad office chairs), a little sewing kit, etc. If you travel a lot save your "extras" list and print out a new copy for every trip. Why remember more than you have to? Do the same thing for toiletries — there's no percentage in taking up mental space remembering whether you packed a toothbrush or not. Make a list and check "toothbrush" off it. If you travel more than once a month, keep a toiletry set all packed and ready to go. (When you come home from a trip, replenish it right away.) I like to keep two sets packed: one in a quart ziplock bag for carry-ons, and a larger one for when I check baggage. If it's a work trip, you should also have a work checklist: laptop power supply, charger for phone, ethernet cable, etc., etc. 6. 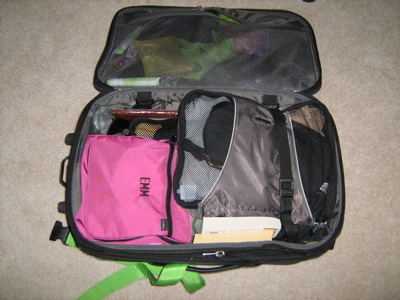 Use packing cubes . I know they seem gimmicky, but they are so useful. First of all, they make life easier for the TSA, and you really don't want to piss them off. Which would you rather have a stranger do: pick up your nicely-packed cube and peer under it, or rummage through a suitcase full of loose clothes, possibly dumping them on the floor? I've seen that happen, and it's ugly. 7. Shoes. Here's my rule for shoes: For any trip longer than three days, you need two pairs of shoes, but no more than three. 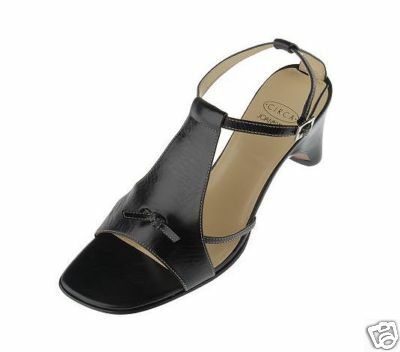 (Four, maybe, if you have to bring a pair of fancy shoes for a party.) Two pairs is so that if your shoes get wet, or cause a blister (which they shouldn't because you have also packed an anti-blister stick to use on your feet), you have a pair to switch off to. Also, if you bring the bare minimum of shoes and develop a sudden need for another pair, you now have an excuse to go shoe-shopping. I don't have to say again that you shouldn't be wearing flip-flops in the airport, right? You should not be bringing more handbags than you bring pairs of shoes, unless you are Judith Leiber. — if you haven't worn the thing you are going to pack in more than a month, try it on before it goes in the suitcase. — always bring one more pair of underwear and socks than you think you will need. — don't stress about wrinkles. Most hotels have fairly decent irons and ironing boards, and it takes less time to press something than it does to worry about what's going to wrinkle and what's not. I can usually iron everything I've packed in less than half an hour, while watching the hotel television (and there's always an episode of Law and Order playing in every hotel room, everywhere, at every hour of the day or night). — shoe bags are nice. I'm just saying. — think: what would be the most inconvenient and irritating thing to have find in the city where you're going, on the trip you're planning? ("sanitary" supplies? A spare power supply for your laptop? Your special moisturizer? ) Bring extra of that. — if there's any chance that you will be getting in late, make sure your toothbrush, face wash, and pajamas are the easiest things to find in your suitcase. I know I haven't said anything about rolling vs. folding, or how to cram your socks into your shoes to save space, compression bags, etc. I find I rarely need to do any of that stuff. I put the clothes in the cubes, put the cubes in the bag, take one last look at my lists, and go to sleep early enough that I can wake up in time to make my flight in the morning. Have a good trip! Send me a postcard. I just got my first swatch of my very first fabric, and here it is! The fabric has a slick hand, which I think will go away when I wash it (I haven't yet). 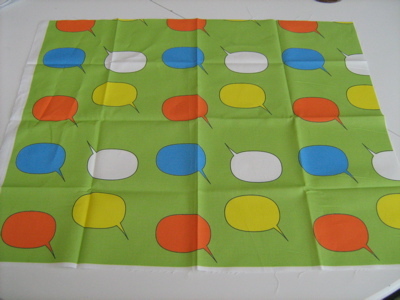 I bought a swatch first, since 5 yards of 42" (which is of course what I would want) is about $90. 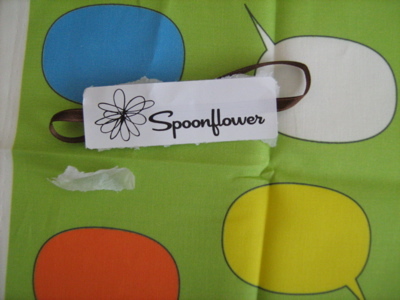 I asked Spoonflower if they were going to do some kind of split-commission sales model (like CafePress does) and they said they were looking into it. 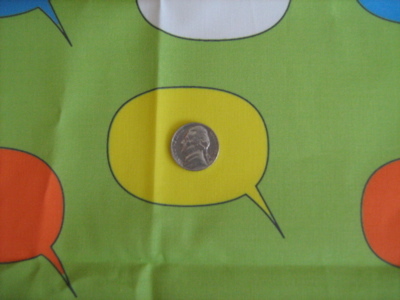 I am really only interested in making fabric for myself at this point, but if it becomes easy to sell it (that is, I don't have to doing anything more than click a little box that says "Make this available in the Spoonflower store") I probably would. 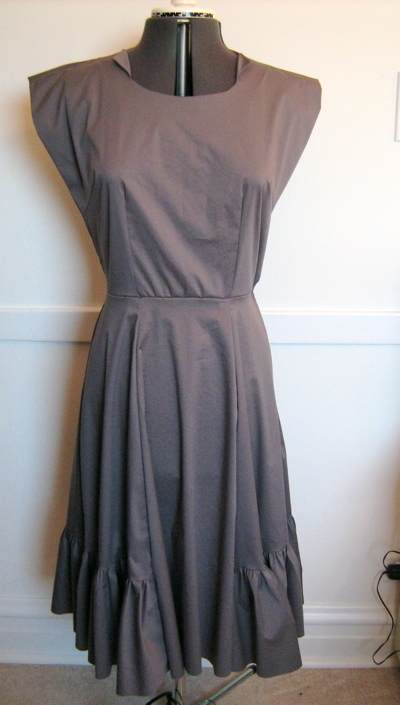 Quick update on the gray dress — I loved getting so many suggestions! Lots of stuff I hadn't thought of … I think, for immediate gratification, I'm going to narrow the sleeves a bit to make them more "cap" and less "kimono", and then add an orange obi-style belt (I kinda want to wear it Saturday — yeah, I know). Then I'm going to order MORE of that fabric and make it again with a v-neck. 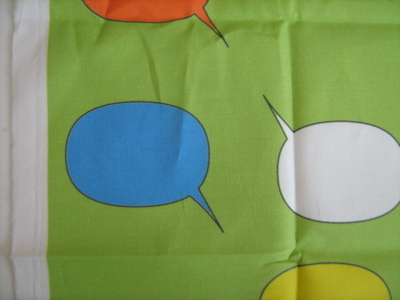 (The fabric was only $1.99 at Fashion Fabrics Club, so I feel justified spending another $15 (including shipping). So this is what I worked on this weekend. I'm not *thrilled* with it, and so I figured I'd put it up for your comments. 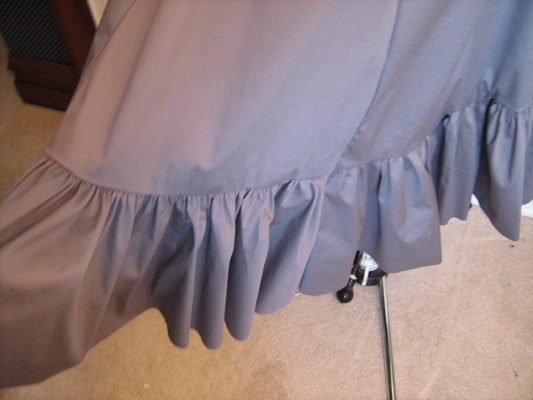 — the skirt was originally about 3" longer, which was WAY TOO LONG, Texas-compound long, but I'd already sewn on the ruffle, which meant I had to take it up from the waist. Which meant resewing the seams on either side of the center front and back piece (had already put in the pockets, too, so I didn't want to resew those seams). 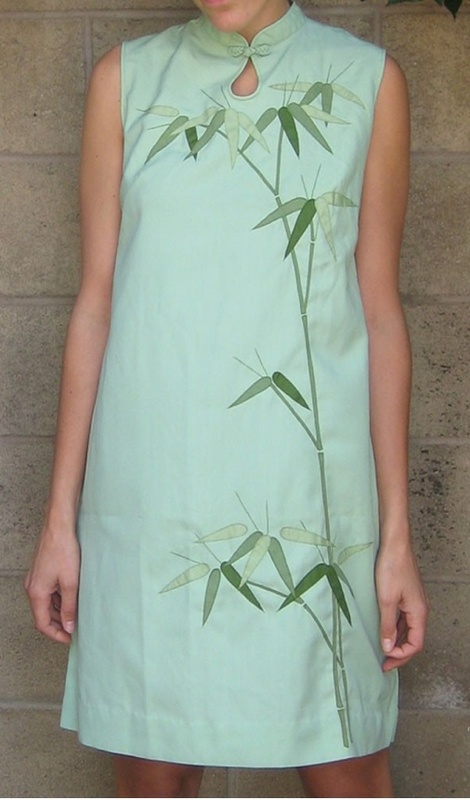 — I wanted to match the darts with the center front seams so I had to ease the front into the skirt and so it wrinkled. I think if I stay it with some twill tape it will stay stretched, but I haven't done that yet. — I thought I was ready for an elegant gray dress, monochrome and understated and all that, but now that I have one I think it needs some color. Where? I could sew middy braid around the neck and hem … or, you know, I could just wear a yellow cardigan over it (which is what I'll probably end up doing anyway). The weirdness on the right-hand side of the picture (left-hand side of the dress) is from pinning it — I haven't put in the zipper yet. Nor have I sewn down the sleeve self-facings. I don't know where they went; all I know is that I can't find them. Arrgh. So I took a six-gore skirt from a pattern I had NOT lost the pieces from (McCalls 3036, which I don't have a link to right now), did some rudimentary math and some pattern.jpgece surgery, and put together the skirt. Then I just slapped on the bodice from McCalls 8858 again.